The Minicom Digital Signage by Kramer VDS-B is an 8-port CAT5 Video Display Broadcaster which is a part of the Minicom DS Video Display System. The VDS is the quickest, most efficient way to move multimedia content from player to multiple displays. A one-to-many, point-to-multi-point system for transmission of high quality video (VDS) or audio and video (AVDS), the system distributes rich multimedia content in real-time from any type of player to multiple display devices. Minicom DS's VDS provides the flexibility you need for a customized digital signage installation, allowing you to position your display devices up to 110m/360ft from the player. Mount displays strategically in public view; keep the hardware needed to run multimedia content out of public reach. VDS is one of the more cost effective ways to get a digital signage system up and running in your place of business. For large displays, the cost of plasmas with built-in CPU can be prohibitive. A dedicated, out-of-band system like the VDS lowers the cost of displays significantly. The VDS Remote Dual Screen (sold separately) provides simultaneous support for two display units at the same location. The VDS Remote Dual Screen lets you double the monitors in the system and saves on CAT5 cable and installation costs. Like the VDS Remote, it can be connected to either a VDS Broadcaster or VDS Line Splitter and receives its power from the CAT5 cable. System Range - 110m (360ft). 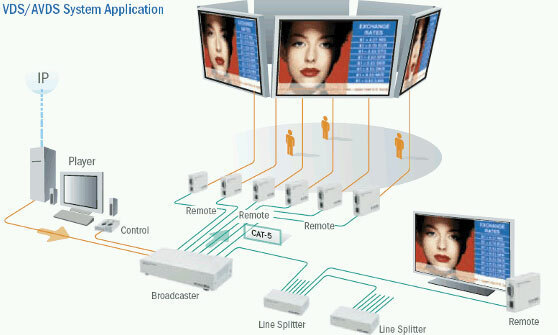 Cost Efficient Transmission - Transmit to two back−to−back screens via a single (dual screen) remote. Out-of-Band System - For fast image transfer. Local PC Input - On remote for classroom control applications. Power Over CATx - No need for power supply at the remote side. No Player or Computer Needed at Display End. Optional Remote - On/off screen control. Question: what does a flashing green power light mean? I'm not getting any signal through my unit and I has previously always functioned properly. I am sorry to hear that. If you have already checked all the cable connections, we would recommend contacting the manufacturers Technical Support at +972-73-265-0200 to resolve this issue (Note, Minicom Digital Signage is now owned by Kramer Electronics).